I heard about Peter Burke’s book for the first time last spring. I had already started lettuce outside, so I figured I’d wait until fall to give it a read. I requested it from the library in late October, and honestly: this one’s a game-changer. I don’t say that lightly! 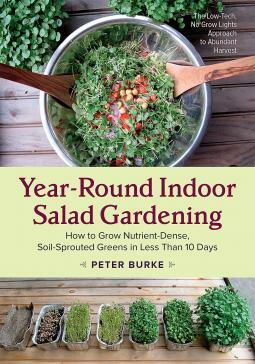 Book: Year-Round Indoor Salad Gardening: How to Grow Nutrient-Dense, Soil-Sprouted Greens in Less Than 10 Days, by Peter Burke. What really excited me about Burke’s process is that is has a low start-up cost. He doesn’t use grow lights, and he grows his sprouts in reusable foil half-loaf pans, wonderful for people short on money, time, and space. I read the whole book and it seemed silly not to give it a try. 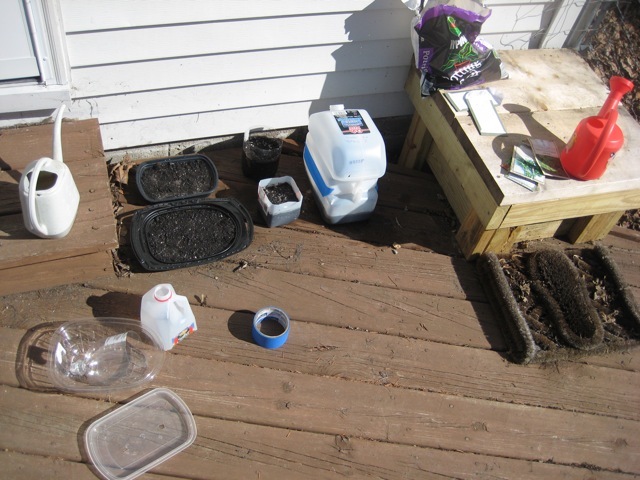 My initial investment was around $40—and even if it completely failed, I would be able to use everything I bought in my regular garden next summer. It was a gorgeous fall day so I worked outside this first time. 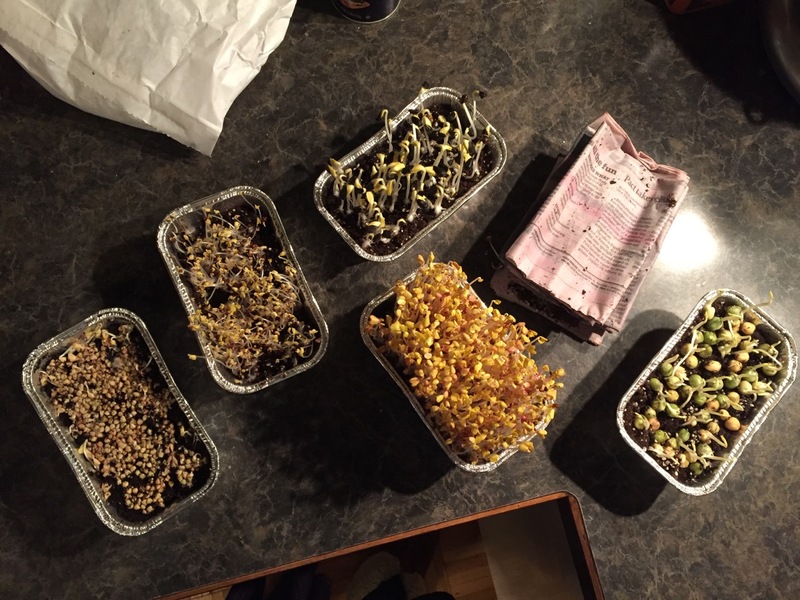 The seeds I sprouted, from left to right: radish, sunflower, buckwheat, pea, and broccoli. 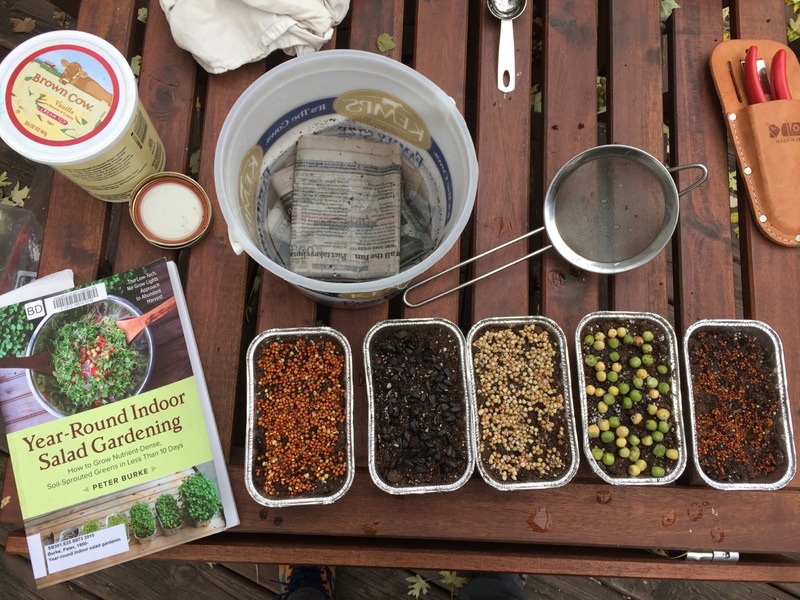 After soaking the seeds overnight and preparing some seed starting mix (you add compost and liquid kelp to it), spread the seeds out on the surface and cover with soaked, folded up newspaper. Place in a dark, warm cupboard–warmth is important to get them to sprout quickly and without rotting. After placing them in a bright window for a few days, they started to look much better! Here they are all cut up and ready to eat. I was still very skeptical at this point. Would the kids even be willing to try them? Happily, the kids tried AND liked them very much. 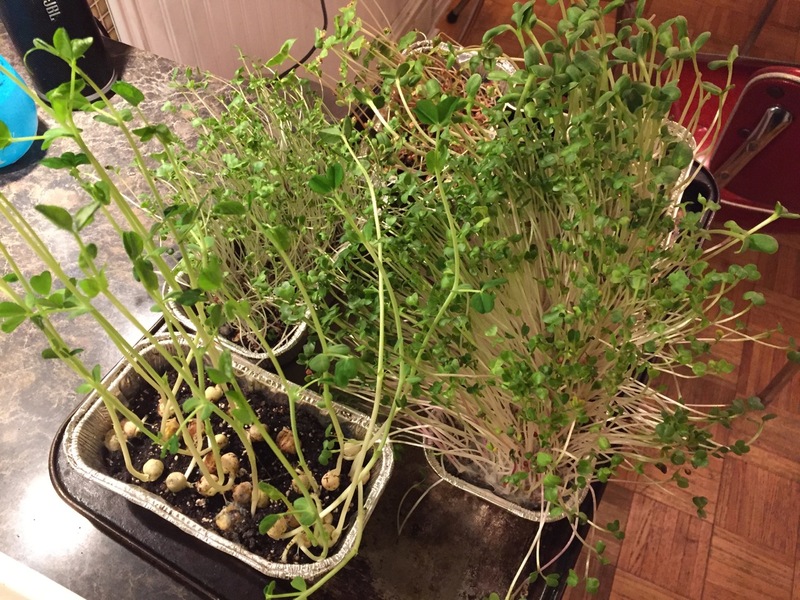 We ate our third sprout harvest last night. Next week, I’m going to increase my production from one to two meals per week. Burke grows enough to eat these every day… will I get to that level some day? Perhaps. I did have to order more seeds already and soon I will have to order more seed-sprouting mix. But my total cost per meal is less than what I’d pay for California lettuce, and tastes fresher. Also, because these are the “seed leaf” of the plant and not the true leaves, the nutrition levels are higher than normal lettuce. 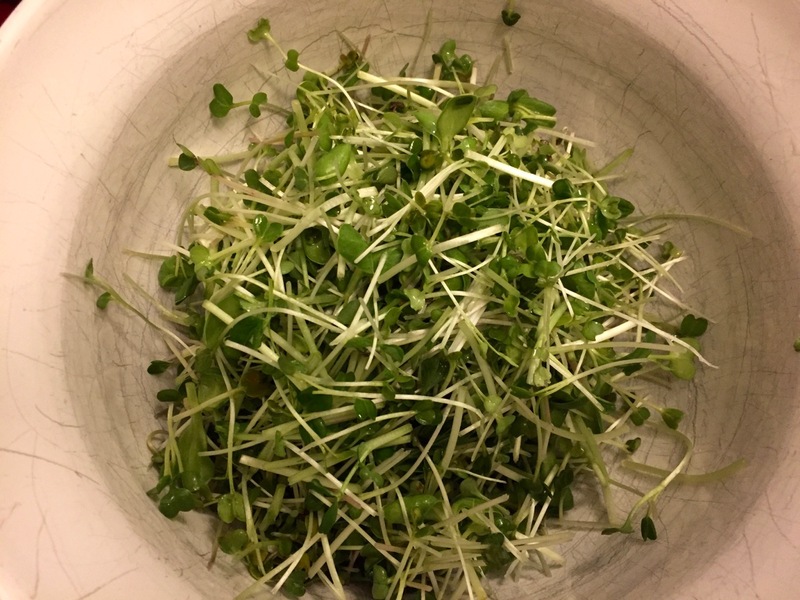 They taste so good that Anneke has been sneaking sprouts before we even harvest them. At the Seward Co-op the other day, I saw that I’m not the only one experimenting with these. The prices don’t seem too terrible, but suffice to say it’s still cheaper to DIY this one. 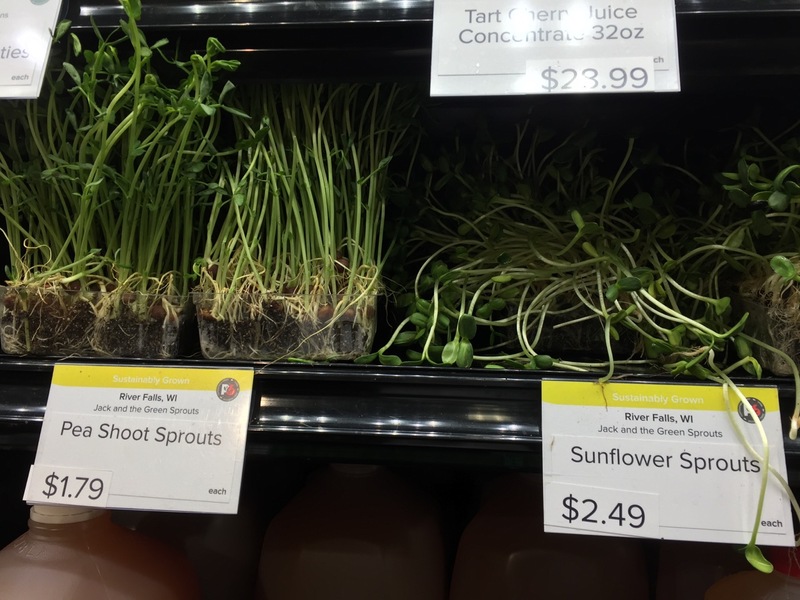 My favorites are the sunflower and pea shoots. The buckwheat shoots taste delicious but continue to be the poorest in germination rates, though I’ve seen improvement since that first round. This book is now on my DEFINTELY BUY list. I highly recommend giving this a try. Categories: Gardening, Nutrition, Permaculture, Practical, US Food Production | Tags: book reviews, DIY, Permaculture, seed starting | Permalink. Last year I started some seeds outdoors, after hearing about it from a fellow Master Gardener. Some of my seeds never sprouted, and some of my containers ended up full of airborne weeds. I think I maybe got one cabbage plant out of the experiment. As a result, I wasn’t too keen on trying it again this year. BUT! Now I finally got a little more information on this topic from a podcast by North Shore Community Radio, of all random things. The show, called Northern Gardener, featured a lot of awesome, useful information, and darnit if the hosts don’t sound exactly like Marge Gunderson. I realize now that I made some key mistakes. For one, I should have stuck with plants from hardier seeds — plants that might typically re-seed themselves anyway. Secondly, I should have very carefully labelled everything so I would know exactly what each thing was. Third, I should have used translucent/transparent containers instead of opaque ones. I think that large water jug was too opaque. So, lesson learned. I may try this again. If you have the inclination, this podcast and accompanying list of recommended plants is highly recommended. Categories: Gardening, Practical | Tags: seed starting | Permalink.